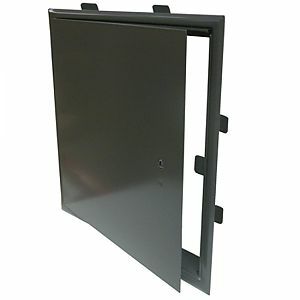 Lightweight door that installs easily by bending tabs on the return back to grip the drywall. 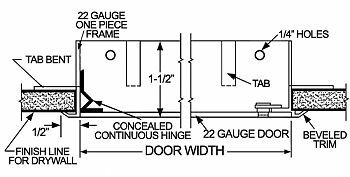 Frame, return and doorstop are one-piece construction with a 1/2 inch wide beveled frame. Flush locks, screwdriver operated with stainless steel cam and stud or cylinder lock with dust shutter. Prime coat rust inhibitive electrostatic powder, grey enamel. Door Size: 12" x 12". Opening Size: 11-13/16" x 11-13/16".